This CD is out of print. Now available only as a digital download. 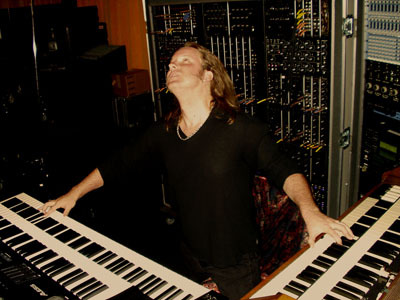 (Los Angeles, 28 August 2004) Master synthesist and composer Erik Norlander makes a triumphant return to his electronic roots with his new instrumental CD entitled SEAS OF ORION, a six song full-length album of magnificent proportions. From the subtley atmospheric to the sprawlingly epic, Norlander recorded SEAS OF ORION in the spirit of the electronic greats of the 70s using only synthesizers and percussion -- no guitars, no vocals, no piano, no organ -- in a beautiful melange of electronic soundscapes, kinetic grooves and emotive leads. SEAS OF ORION harkens back to Norlander's 1997 debut album, THRESHOLD, which was reissued earlier this year as a 2CD Special Edition via Norlander's Think Tank Media label. And like THRESHOLD, SEAS OF ORION features percussionist Greg Ellis (Vas, The Matrix films) again delivering his well-known and unique blend of world ethnic percussion and western progressive jazz drumkit rhythms. Ellis is a strong proponent of "organic rhythm" -- rhythms played by humans for humans -- and that propensity comes through loud and clear on SEAS OF ORION. Another SEAS OF ORION link to Norlander's Threshold album is the astounding cover art by English science fiction artist Jim Burns. 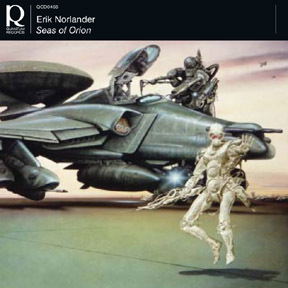 The cover art shows implies a melding of man with machine, a theme that Norlander and Ellis has explored in the past and venture into again with Seas of Orion. 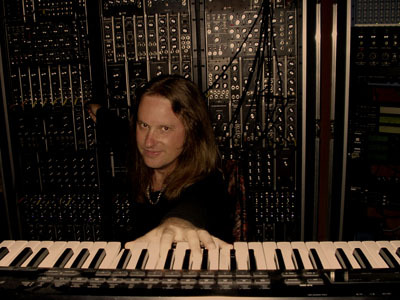 Much of SEAS OF ORION was composed and performed on Norlander's gargantuan Moog modular synthesizer dubbed by fans as "The Wall of Doom". The label has stuck, and "The Wall of Doom" continues its mission as Norlander's primary instrument. Made up of discrete analog synthesizer modules mostly from April of 1967, the instrument is a real vintage gem and is truly among the first commercial synthesizers ever created. 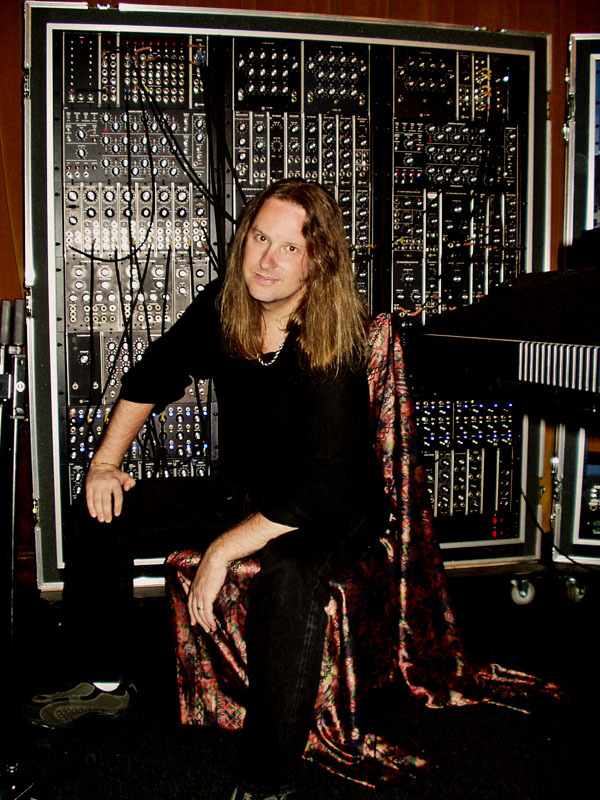 Norlander speaks about The Wall of Doom, "Originally built in 1967, the Moog modular actually pre-dates ME by three months [Norlander was born in July of 1967]. And when you consider that we had not yet put a man on the moon when this instrument was created, it puts quite a historical perspective on the synth." 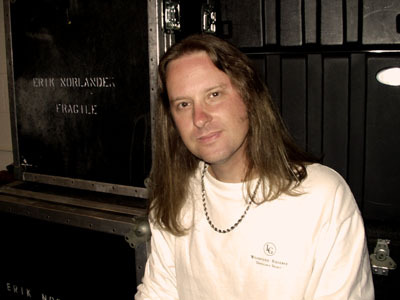 Norlander has toured extensively with The Wall of Doom, carting it across the United States and Europe from 2001 through 2004. He has plans to take it to Japan in 2005. The music of SEAS OF ORION is progressive, and progressive in Norlander's own highly identifiable style. There are long, sprawling ambient passages, but there is also melody and groove. Norlander aims to keep the melodies memorable but never trite or overtly commercial and to keep the grooves infectious but never mindlessly repetitive or loop-oriented. Songs like "City of Living Machines" may indeed find their way to the club dance floor through their compelling blend of analog synth bass and organic drum and percussion undulation, but it won't be because of any targetted marketing effort. "I've never been particular drawn to dance music", says Norlander. "But occasionally we'll put together a piece that has a sort of club appeal due its rhythmic propulsion -- that's a phenomenon that I do not specifically intend but welcome nevertheless." Probably the standout piece on SEAS OF ORION is the 22-minute epic, "Adrift on the Fire Seas of Orion's Shield" -- an awesome sonic event that could have easily come from the chambers of 70s electronic greates such as Tangerine Dream or Klaus Schulze. Norlander set out to create this piece with great intent. He writes in the album's liner notes "I tried three times to create the piece, and I abandoned all of these efforts. The problem was that I was thinking too much in terms of traditional songwriting." 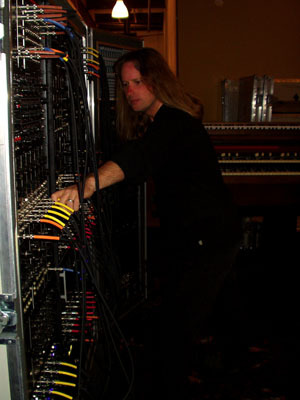 Norlander had a breakthrough the fourth time around when he changed his compositional approach and even his usual recording technique. "I had a breakthrough on the fourth time around when I took a completely different approach. I set up a phalanx of synthesizers in a circle around me, I set up tracks for each one, and I hit record. Many of the sounds were set to drone on without retriggering, by adding, subtracting and modulating these sounds, I was able to create the "living environment" that I was after." The epic journey begins with tension and anticipation, ebbs and flows to and from several climaxes, and finally winds down into a peaceful release when it segues into the next song, "Oasis in Stasis", a lush and moody song built over a cleverly long ostinato pattern, modulated by sequenced analog synthesizers whose envelopes and filters are constantly moving under the hands of Norlander's real-time performance. lieu of the usual Wedding March." The wedding ceremony was many years ago, but the power of the song remains. It seems only natural that Norlander should offer his interpretation of the piece here on this electronic release. Another piece worth mentioning is the opener, "Fanfare for Absent Friends", an emotive song that starts with a low, moody drone and builds to a triumphant fanfare played over both martial cadences and speedy rock grooves. 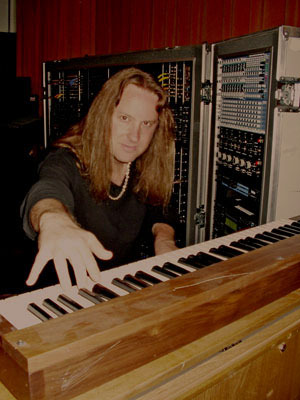 Prior to the recording of SEAS OF ORION, Norlander was contracted to headline the 2004 Alfa Centauri Electronic Music Festival in The Netherlands. Norlander, along with festival organizer Eric Snelders, planned to release SEAS OF ORION at the festival itself -- combining the album's debut with a sort of live performance release party. The date of the festival had been planned for some time ... September 11, 2004. That fateful date of couse harkens back to the terrible events of 2001 when terrorists attacked New York City and Washington, DC. So when Norlander set about composing the album, he was keenly aware of the date on which it would be released. "I really wanted to do something special to acknowledge this date, and so I composed the album opener, 'Fanfare for Absent Friends' as an homage to those lost. But rather than make it a dark and sad piece, I chose to create a triumphant and uplifiting fanfare to honor the memory of the fallen. It is the lives of these people we should celebrate and remember and not their deaths." Like all of Norlander's releases, SEAS OF ORION is masterfully recorded and exquisitely executed. SEAS OF ORION is Norlander's 5th solo album following closely on the heels of his new live CD, Stars Rain Down, recorded in Europe in 2001 and 2003 and already garnering extensive critical praise from the press and fans alike. Norlander is known for his ability to traverse musical styles with the ease of an accomplished alpine skiier, and this year's releases are perhaps the strongest case for that yet. While it remains a keyboard-oriented album, STARS RAIN DOWN, has a decidedly hard rock and almost heavy metal feel to it courtesy of Norlander's magnificent European touring band consisting of traditional rock guitar, bass, drums and aggressive vocals. The release of SEAS OF ORION goes almost in the complete opposite direction with its pure usage of synthesizers and percussion. The dichotomy is pure Erik Norlander, an artist who continues to deliver the goods with grace, style and integrity. Back in 2001, I had the good fortune to be invited to play at the Alfa Centauri Electronic Music Festival in Bussum, Holland, as part of that year's European Tour. A Dutch journalist friend named Paul Rijkens introduced me to Eric Snelders, the festival organizer. Paul had apparently suggested to Eric that I would be a good addition to the festival which was to be headlined by none other than the mighty Rick Wakeman. I sent Eric a CD of my more "electronic" sounding music, and I think he enjoyed it. Well, I suppose he must have enjoyed it as soon I was asked to play the set just before Rick's at Alfa Centauri 2001. That was quite an honor, and it is one that I shall never forget. The festival was a memorable experience indeed, and in many ways it launched a series of solo performances that continue on to this day and hopefully beyond. Following the Alfa Centauri 2001 festival, I was asked to play a similar solo set at the first ProgWest Festival in Southern California. That went over fabulously, and I even included a live audio and Quicktime video track of one of the performed songs ("Trantor Station") from that concert on the 2004 Special Edition reissue of my debut solo album, 'Threshold'. I played similar solo sets in the years following, not only when I would appear as a solo artist, but also within the live sets of Lana Lane and my band, Rocket Scientists. I am happy to have made these solo performances in the USA, Japan and in Europe, and they seem to be quite well-received in all of these places. Then late last year in 2003, Eric Snelders invited me to return to the Alfa Centauri Electronic Music Festival for 2004, but this time as the headliner. I accepted immediately, of course, and we began to discuss plans for the concert. Eric also suggested that I consider recording an album of electronic music in contrast to my more "symphonic" albums of recent years. We both agreed that it would be fantastic to release such an album at the festival itself, combining the live concert with a sort of record release party. As fans of my albums and the Lana Lane albums already know (and I believe I can say this without any arrogance), I have no difficulty in being a prolific artist and taking on heavy workloads. So I decided to commit to this electronic album. My planning and architecting of the album began almost immediately. I had the concept in mind to create one very long, sprawlingly epic piece in the style of the 70s electronic greats like Tangerine Dream and Klaus Schulze. I came up with the title "Adrift on the Fire Seas of Orion's Shield" before composing one single note. The title would dictate the direction of the piece as well as the general mood and feel. I tried three times to create the piece, and I abandoned all of these efforts. The problem was that I was thinking too much in terms of traditional songwriting -- of melodies, of verses, of choruses, etc. -- and that ended up creating music that sounded much less epic than what I wanted and more more like something you would hear in the elevator on the way to visit the doctor. I had a breakthrough on the fourth time around when I took a completely different approach. I set up a phalanx of synthesizers in a circle around me, I set up tracks for each one, and I hit record. Many of the sounds were set to drone on without retriggering, by adding, subtracting and modulating these sounds, I was able to create the "living environment" that I was after. 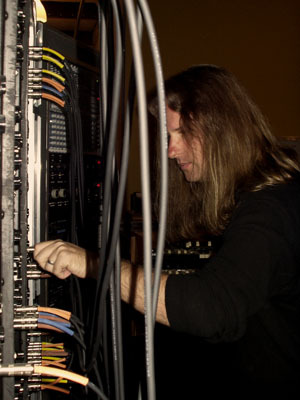 I started the piece with a sort of alien wind from the modular Moog system, and that in itself was quite inspiring. Wind is a sound that is easy to make on just about any analog synthesizer with a noise generator and a resonating filter, but with the modular system I was able to use a particularly complex patch (a literal "patch" in this case -- lots of cables!) that modulated in unpredictably compelling ways. I even asked my friend and modular synth enthusiast, Mike Peake, for some additional modulation ideas. The result went through the Moog 905 spring reverb and then again into a Lexicon reverb for additional spaciousness. Next I began to set up some self-oscillating filter drones on various synths that would sweep through musical sounding harmonics and create an almost "sequence-like" series of perceived notes. You may find it surprising that the most effective synthesizer I own for this kind of sound is the tiny but powerful Moog Rogue. I even ended up multitracking the Rogue in different tunings and octaves for this effect since it worked so well. I then made three pad passes on the Roland JX8P while manually sweeping the filter and bending the tuning. The JX8P uses digitally controlled oscillators through a very identifiable analog filter and attenuator that clips in sort of an odd place. For my ears, that causes the JX8P to occupy a very particular space in a mix, and hence I have become a big fan of this synth and its rack-mounted cousin, the MKS-70. Synth leads on this sprawling piece come from the modular Moog and the Moog Rogue. The acoustic guitar sound that enters later on in the journey is courtesy of the Yamaha SY99, which is now becoming somewhat of a vintage instrument itself! The flute on this piece and also on the intro of "Fanfare for Absent Friends" in my usual stereo combination of Chamberlin and Mellotron flute, played here in sampled form via the Akai Z8. Speaking of "Fanfare for Absent Friends", I should mention that the release date for this album, as well as the festival date for my Alfa Centauri performance, is September 11, 2004. Three years earlier, September 11, 2001, was a dark day for the entire world when thousands of lives were lost in a series of senseless attacks on New York City and Washington D.C. I believe it important for all of us to remember these events and to remember those lost. The date for the Alfa Centauri concert was set early on, so before I began recording this album, I knew that it would be released on September 11. I really wanted to do something special to acknowledge this date, and so I composed the album opener, "Fanfare for Absent Friends" as an homage to those lost. But rather than make it a dark and sad piece, I chose to create a triumphant and uplifiting fanfare to honor the memory of the fallen. It is the lives of these people we should celebrate and remember and not their deaths. Lastly, while this is indeed a solo album, I must acknowledge the one other musician that appears on this disc. I asked percussionist Greg Ellis to play on 'Seas of Orion' to bring an organic element to the project, something at which he excels! Greg layed down several tracks of ethnic percussion to great effect on my 'Threshold' album back in 1997 -- arguably my most electronic sounding release prior to this one -- and I wanted to recreate some of that magic on 'Seas of Orion'. 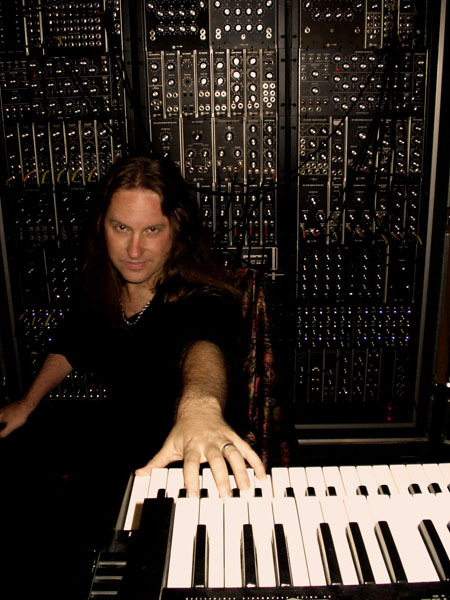 I recorded about 95% of synthesizers first along with some reference drum loops and programmed sections before bringing Greg into the picture. I then took the files over to Greg's studio in the Hollywood Hills where he has just an enormous collection of percussion instruments from all over the world. And Greg's studio has such a vibe, such a mood, it seemed a natural choice to bring the recording to Greg and his world rather than to bring Greg and a carful of instruments out to my studio. The result adds a decidedly human dimension to the album, and Greg's combination of artistic vision and technical chops always are a welcome addition to my projects. I could go on and on, of course, but hey, we have some music to listen to. Now I invite you to prepare yourself to enter this new and vast alien world as we venture together through the Seas of Orion. I hope you enjoy the journey! 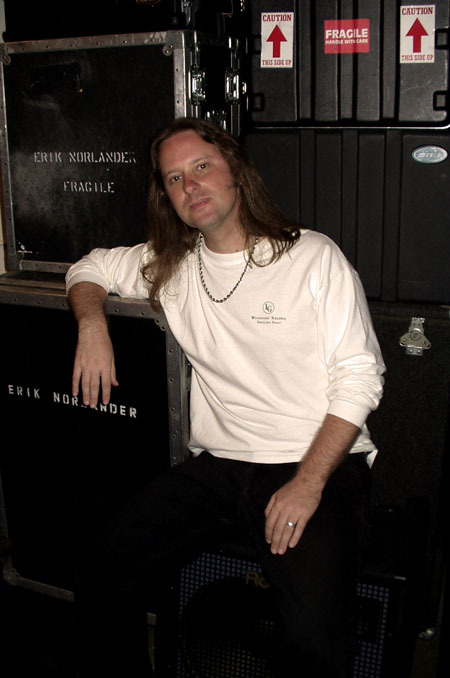 Erik Norlander - Seas of Orion was released through Quantum Records in The Netherlands. All versions contain the identical track listing - there are no bonus tracks on any edition.